Karnak Obelisks - Egypt c. 1,800 BC. 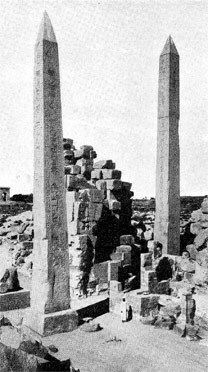 On the left, before the before the Osiris Court of the Great Temple at Karnak, is the leading obelisk of Thothmes I, with the pedestal of its companion beyond; like "Cleopatra's Needle" it was employed by Rameses II for his inscriptions. To the right, beyond the pylon, is the obelisk of Queen Hatsheput, which also formed one of a pair.